Contemporary Germany is a modern industrial democracy admired throughout the world. Many Germans believe that they live in the 'best Germany' that has ever existed. Yet there are dissenting voices: individuals and groups that reject cosmopolitanism, globalisation and multiculturalism, and yearn for the more homogeneous country of earlier times. They are part of a global movement, often characterised as populist, that values tradition over innovation or constant change. In Germany, such people are routinely portrayed as reactionary or even neo- fascist. The present study seeks to provide a portrait of these individuals and their organisations. Very little has been written in English about the cultural figures who play a role in this movement. When the political side is discussed--whether in its manifestation as a party (the Alternative for Germany) or a citizens' group (PEGIDA)--the cultural dimension is usually ignored. Jay Julian Rosellini places the so-called New Right in the context of currents in German culture and history that differ from those in other countries. With Germany the dominant country in the European Union, economically and politically, this volume offers an essential view of its current conditions, future prospects and political particularities. About the Author: Jay Julian Rosellini is Professor Emeritus of German at Purdue University and Professor Emeritus of German and Humanities at Suffolk University (Boston, Massachusetts). He was Visiting Professor at the Universita t Hamburg when the Berlin Wall fell. His scholarship revolves around the interplay between literature and politics in Germany and Austria. 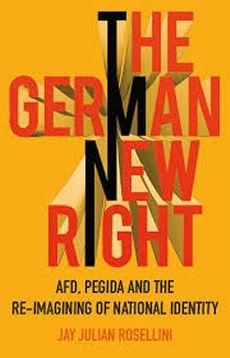 Be one of the first to review the German New Right: AFD PEGIDA &the Reimagining of National Identity.